Police in a Michigan town had a tricky encounter with an unusual perp: a pig on the run who chased a local woman but got distracted by a funny ornament. 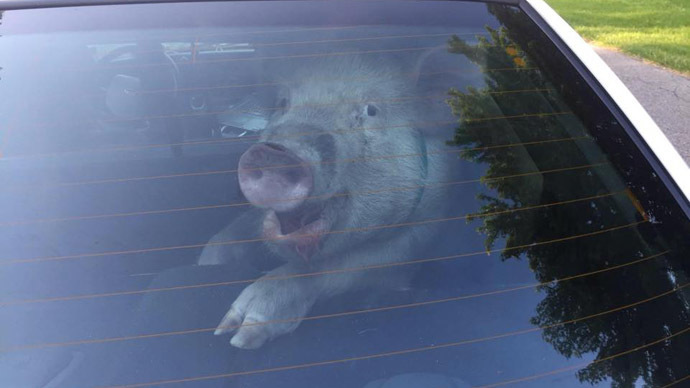 The escaped swine finally ended up in the back of a police car, pooping all over the place. The smelly incident happened in the small town of Shelby, Michigan, on May 28. A local woman, Debbie DeRiemaecker, was gardening in her yard when she was confronted by a pig who had apparently run away from his owner. When the pig, whose name is either Daisy or Pig, according to various media reports, was distracted by a fancy lawn ornament, the woman immediately called the police. Law enforcement officers apparently took the call very seriously and decided to take the pig away in their police car. "Just when you think you've seen it all," Deputy Police Chief Mark Coil told Detroit News. "I've seen pigs at large, dogs at large, monkeys at large, parakeets at large, horses at large. For some odd reason Shelby Township is like Noah's Ark." The chase wasn’t quite OJ, but Shelby PD was providing social media updates as pig hunt unfolded for the runaway porker. A picture of the pig with a mischievous grin went viral online, along with a video of the adorable animal leaving some fresh evidence in the back seat of the police car. The original post had more than 4,000 shares on Facebook. The offender didn't end up in the prison, however: the officers eventually reunited the suspect with its owner. However, before that the plucky porker made some mess in the back of the squad car. The owner offered to clean up the poop in the cops’ car. "Thank goodness, or the rookie would have had a realllly bad day," police joked. "We let Pig off with a warning this time. I think it will be a while before Pig is a road hog and porks in a no-porking zone again! [wink emoticon]"